New Forest Knowledge is a website giving you information on the history, people, places, wildlife and environment of the New Forest from a range of different sources: the New Forest Centre, the British Library, the National Archives, and a number of other museums, libraries and archives. The website is open to everyone, you only need to register if you want to make comments or add your own contributions. The website’s Home Page shows images and titles from feature articles. Clicking on them brings them up to read. Scroll down to see more articles. Click on About to see information about the website, including Guidelines such as this User Guide, Partners in the New Forest Knowledge website, and Copyright information. The Blog has more articles like those featured on the Home Page and draws attention to events, anniversaries, and changes to the sources of information available on the website. The articles are written by New Forest Knowledge staff and other contributors. Type a query in the Search box at the top of the page. You might type the name of an author of a book like Heywood Sumner or the name of documents like New Forest Acts. The result will be a List Page of items which satisfy your search query. The search can be refined using the panel on the left of the page, see the separate List Page section. You can click on the Map tab to show the location of the items, for items that have a map location. If you click to select an item on a List, or select an item on a Map and click again on the pop-up box that appears, an Item Page is displayed showing the detail stored for the item. You can also access information by clicking on one of the Indexes in the main menu at the top of each page: TIMES, PEOPLE, PLACES, SUBJECTS, SOURCES and GROUPS. The result will be a page of words present in that index. Click on Featured to see a page of featured articles related to that index. Click on a word to receive a List Page showing the items indexed by that word. As with the General Search, the Map tab is available and clicking on an item on the List Page retrieves its Item Page. For more on searches, see the Searching section. 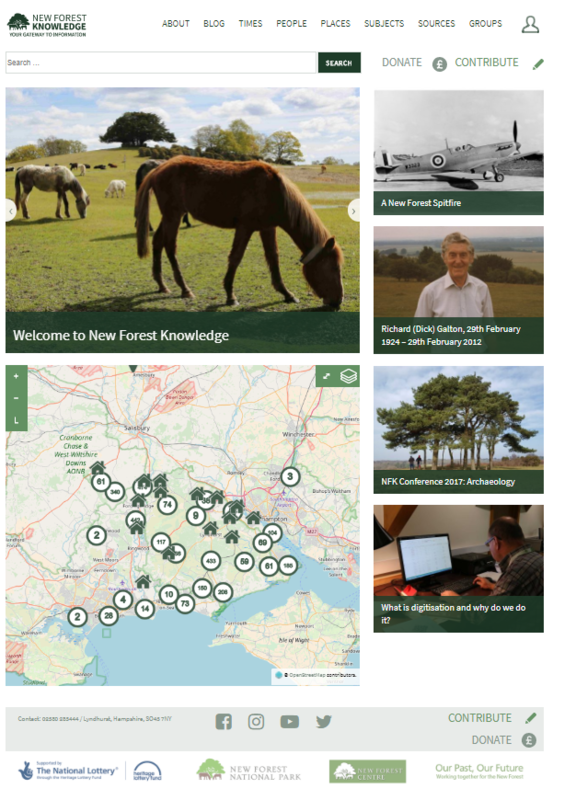 One of the features on the home page is a map showing the geographic location of items of information for which New Forest Knowledge knows the location. Enlarge the map to full-screen by clicking on the enlarge/reduce button . Zoom the map using the + and – buttons. To see the meaning of the symbols on the map, click the legend button . Numbers in circles represent where there is more than one item in a location. As you zoom into the map, the numbers reduce and at maximum zoom you will end up with one item or a list of items assigned to that specific location. To learn more about a location, click on it and a pop-up will appear. Click on the pop-up to obtain yet more information, where it is available. To explore the different information you can display on the map, click on the Layers button . 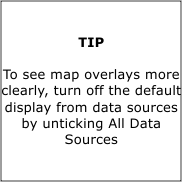 You can select different Overlays of information to display and different Base Maps behind the overlays.